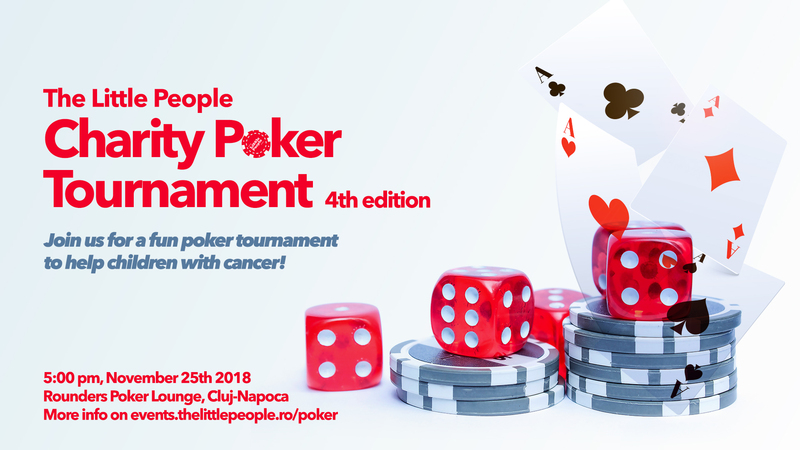 We invite you to participate and have fun playing poker at the fourth edition of the Charity Poker Tournament in Cluj-Napoca. We are raising money for the services that Little People is offering to 2000 children with cancer every year throughout Romania. The event will take place on November 25th 2018, at Rounders Poker Club in Cluj-Napoca. Players will compete in a no-limit Texas hold-em poker event. The last few remaining players at the end of the event will win some great prizes. This year we will host our first Bounty challenge. The concept of Bounty is rather simple: some poker players have a bounty on their head and if you eliminate them, you win an extra prize. But be wary: the bounty people will have a higher amount of chips to start with, so you need to outsmart them in order to win. The players that will be hunted for their bounties will be announced shortly. May the bravest players win ! Just like previous years, you will be able to register a team as a company. The team must be formed of 5 players and at the end of the tournament, the team with the best placed players overall, will win the team prize. The registration fee is 2000 ron and this includes the buy-in and one re-buy or add-on for each player. Also, we will be advertising your company name and brand on our communication channels and social media. Last year, we had teams coming from Betfair, IQuest, Bosch, Steelcase, Smartsoft and Accesa. Join in on the fun and try defeating our reigning champions for 2 years in a row, Betfair! If you want to play, complete the registration form at the bottom of the page and we’ll send you all the details. Va invitam sa participati la cea de-a IV-a editie a Turneului de Poker Caritabil din Cluj-Napoca. Scopul turneului este strangerea de fonduri pentru serviciile de suport psihosocial oferite de Asociatia Little People copiilor cu cancer din cele 9 centre de oncopediatrie din tara. Evenimentul va avea loc pe 25 noiembrie 2018, la Rounders Poker Club din Cluj-Napoca. Incepand cu ora 17:00, jucatorii vor concura intr-un turneu de poker no-limit Texas hold-em. Ultimii jucatori ramasi la finalul evenimentului vor castiga premii. In acest an vom organiza pentru prima data Bounty challenge. Conceptul de Bounty este destul de simplu: unii jucatori vor avea o recompensa/un bounty si daca ii eliminati castigati un premiu special. Insa, sa aveti grija: jucatorii urmariti vor avea mai multe jetoane de inceput, deci trebuie sa jucati inteligent pentru a castiga. Jucatorii care vor avea bounty vor fi anuntati in curand. Fie ca cei mai buni jucatori sa castige! La fel ca in anii precedenti, veti putea inregistra o echipa ca si companie. Echipa trebuie sa fie formata din 5 jucatori si la finalul turneului, echipa cu cei mai bine clasati jucatori, va castiga un premiu pe echipa. Taxa de inscriere este de 2000 ron si aceasta include buy-in-ul si un re-buy sau add-on pentru fiecare jucator. De asemenea, vom publica numele companiei si logo-ul dvs. pe canalele noastre de comunicare si social media. Anul trecut, am avut echipe din partea Betfair, IQuest, Bosch, Steelcase, Smartsoft și Accesa. Alaturati-va distractiei si incercati sa invingeti campionii nostri de 2 ani la rand, Betfair! Daca doriti sa participati, completati formularul de inregistrare din partea de jos a paginii si va vom trimite toate detaliile. Vom adauga mai multe informatii in curand. Copyright &copy 2018 Asociatia Little People Romania.